Map of CMB temperature fluctuations with slightly colder areas in blue, and hotter areas in red. 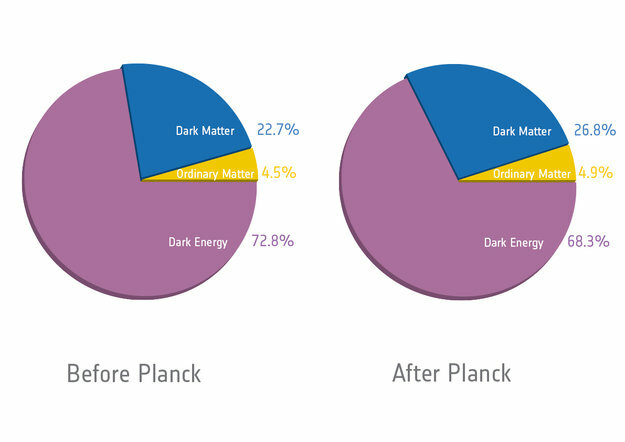 The first results from the European Space Agency’s Planck satellite have provided excellent confirmation for the Lambda-CDM (Dark Energy and Cold Dark Matter) model. The results also indicate somewhat more dark matter, and somewhat less dark energy, than previously thought. These are the most sensitive and accurate measurements of fluctuations in the cosmic microwave background (CMB) radiation to date. The prior best estimate for dark matter primarily from the NASA WMAP satellite observations, was 23%. So the dark matter fraction is higher, and the dark energy fraction correspondingly lower, than WMAP measurements had indicated. Dark energy still dominates by a very considerable degree, although somewhat less than had been thought prior to the Planck results. This dark energy – Lambda – drives the universe’s expansion to speed up, which is known as the runaway universe. At one time dark matter dominated, but for the last 5 billion years, dark energy has been dominant, and it grows in importance as the universe continues to expand. The Planck results also added a little bit to the age of the universe, which is measured to be about 13.8 billion years, about 3 times the age of the earth. 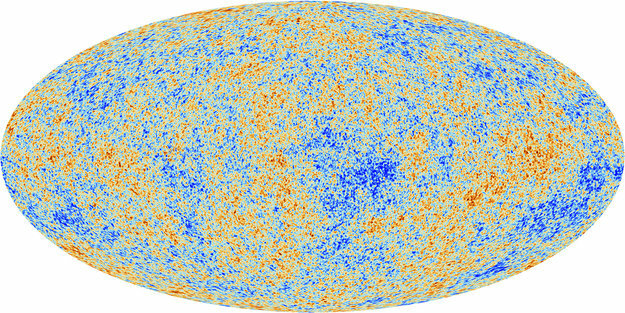 The CMB radiation itself, was emitted when the universe was only 380,000 years old. It was originally in the infrared and optical portions of the spectrum, but has been massively red-shifted, by around 1500 times, due to the expansion of the universe. There are many other science results from the Planck Science team in cosmology and astrophysics. These include initial support indicated for relatively simple models of “slow roll” inflation in the extremely early universe. You can find details at the ESA web sites referenced below, and in the large collection of papers from the 47th ESlab Conference link. This entry was posted on Tuesday, June 18th, 2013 at 6:46 pm	and tagged with CMB, cosmic microwave background, Dark energy, Dark matter, ESA, Planck, runaway universe, WMAP and posted in Big Bang & Inflation, Dark Energy, Dark Matter. You can follow any responses to this entry through the RSS 2.0 feed.